Apparently one of the radio stations said it would make landfall tonight and that there was significant rain up north now. 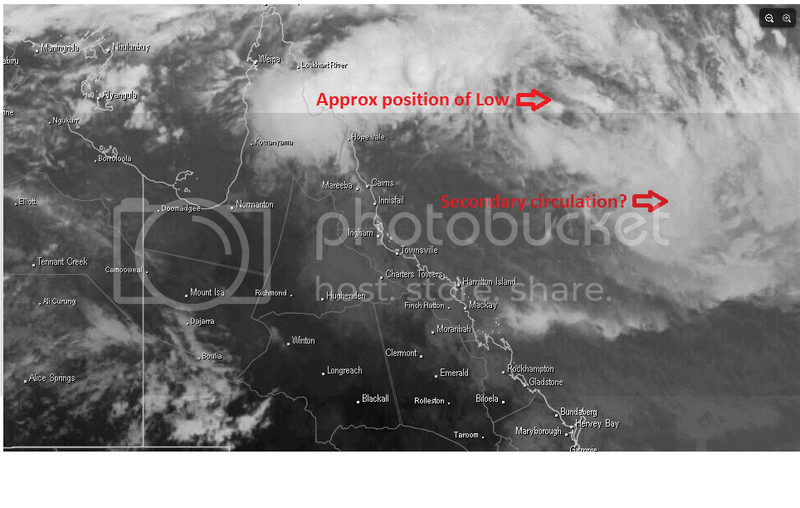 So if the 'low' is still 3.5 days off making landfall, what is the large cloud mass over the top of north QLD that I can see on the satellite image above? Is it related to the 'low'? Sorry, just confusing having the two cloud masses moving away from each other up there, the satellite and the MTSAT look very interesting anyway. Dont think it will hit Cairns at all.... more likely to go South - Flying there tomorrow for a police conference - no flight delays at all. What you are seeing there is convection along the Monsoon Trough. The LOW is still connected to the Monsoon Trough. My place gets salt water inundation from a 1m storm surge above a HAT ( king tide ). Gonna start figuring out a plan I think. Yeah Trav, I like it for our region at this stage. A slight westerly movement for a bit then a general SW curve as the land mass comes into play. Personally I would like it further north so we get more rain further out west, but lets face it, we will take what we get given. Yikes Trav you need to start sand-bagging or something - when are you guys planning on hitting the road? What are good websites for projected multi-model tracks? Stormcast (GFS) had the eye passing pretty much directly over Cairns late Thursday from their latest run. Does that mean when an eye is above cairns its going to be nice and sunny....?????? I don't know if it's just my eyes, but there seems to be a new Low spinning up to the SE of this system, and it appears to be moving to the SSE..
You can clearly see something on the animated infrared sat image. Yeah Things, it looks to struggling a bit, but there is still time. Even if it does make TC status it wont be strong, but looking at the cloud mass associated with it, should be some pretty good moisture for a few days. To be honest the LLC actually looks like it's pulling together, but no doubt that dry air to the South is making it a bit more difficult. Loren, this thing doesnt have an 'eye' (Clear and defined LLCC) as of yet And it won't unless it strengthens a lot more. But every cyclone is different and the eye is an ever changing phenomenom (it can destroys and rebuild itself ). The only time I have been in the eye of a cyclone it was cloudy although we did get a few rays of sunshine here and there. So Alexis are you thinking its going to be a CAT 1-2 for Cairns region or forming to a stronger more serious phrase in a few days. Don't rule out the possibility of marginal cat 3 system for this one guys. Just remember Cyclones Ului's rapid intensification prior to landfall and the ingredients were not as good as they are today. 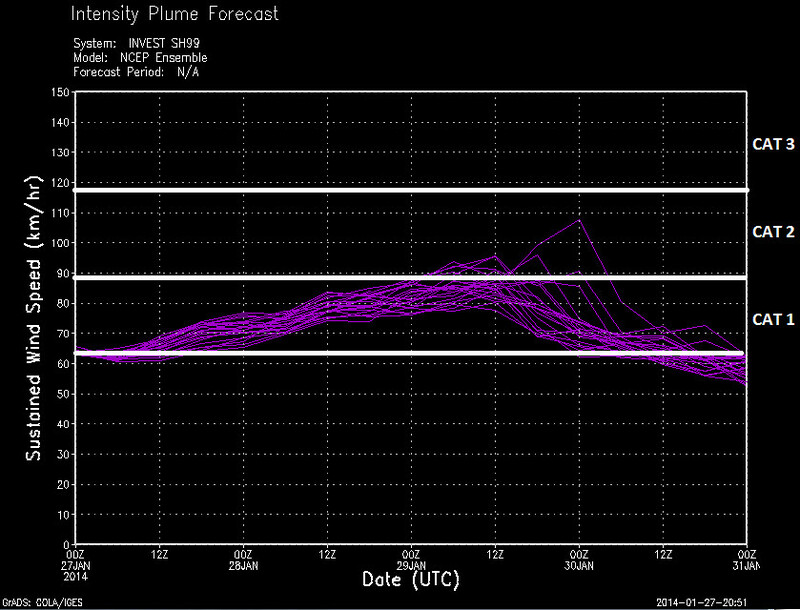 I would say 970hpa at cross point. 'Building a perpetual motion machine is easy - keeping the thing running is the hard bit"
Interesting to see if this low ramps it up a few notches in terms or organisation tonight. It's looked so messy up until this morning but nice to see some rotation starting to happen. Could be Dylan's swan song "Blowin in the wind"
Lol Mouse - I just hope it decresses and does not intensify due to YASI and the amount of destruction that had done on the land and structures of buildings - people were destroyed from that one. Generated in 0.024 seconds in which 0.010 seconds were spent on a total of 13 queries. Zlib compression disabled.